Outlandish Observations: Help celebrate OUTLANDER's 25th anniversary! 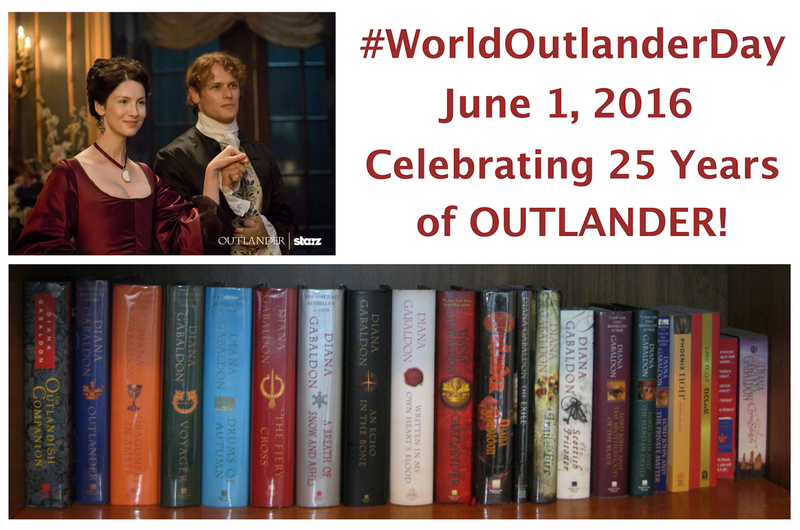 Wednesday, June 1, 2016, is #WorldOutlanderDay! Please join Diana Gabaldon's fans all over the world in celebrating the 25th anniversary of OUTLANDER's publication in 1991. Congratulations, Diana, and many thanks (again) for creating this amazing story! 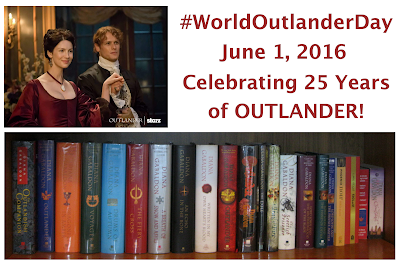 If you're on Twitter, please tag your tweets on Wednesday with #WorldOutlanderDay. Thanks! Hi Karen, what a nice idea is #WorldOutlanderDay! The knowledge & story of "Outlander" was a wonderful gift to me from a friend who told me all about this beautiful Red-headed Highlander who calls this Time-Traveller nurse "Sassenach." My friend, was taken with this one expression that Jamie used so often to refer to Claire; but not in a mean way, just a loving way! So I just had to hurry out & buy the first two books. Then, I could hardly wait until the third one came out! Thank you, Diana, for creating a wonderful world for readers to get lost in. I heard about Outlander years ago from people on a blog for Highlander the TV series, but I never got around to reading it.Then, I heard that Starz was going to bring Outlander to TV, and at the same time, a friend had started reading the series and passed the books along to me. I couldn't wait to find out what was going to happen next to Jamie and Claire and read the books one after the other last summer. I have been married for a long time to my high school sweetheart who has many traits in common with Jamie. Like JAmie and Claire, we lost our first baby and then had a miscarriage and went on to have two daughters. I grew up on a potato farm! Now , I am anxiously waiting for the next book, watching each new episode on TV, checking this site and Compuserve daily. THank you , Diana, for portraying a long, loving marriage of a couple with a deep spiritual connection. Well we got the best gift to celebrate this day from STARZ. Outlander has been renewed for 2 more Seasons. I think I will binge watch Season 2 to celebrate. My sister had read Books 1-7 and told me that the books were now being adapted and were to air on STARZ. I programmed my DVR, knowing that my sister and I have similar tastes in books and TV shows and after watching the first episode I downloaded the first book. Needless to say I could not stop reading the books and I am now on my 4th read (currently reading Fiery Cross) and have read the Lord John books and other novellas 2-3 times each. I own both Outlander Companion books, have the episodes downloaded from ITunes and also have the DVDs for good measure. My two sisters, my niece and some friends of my sister in LA have formed our own group "Outlander Ladies" on Facebook, we listen to all the podcasts, watch all the interviews, and generally are Outlander Obsessed. We love having this large community of similarly obsessed and devoted fans of these amazing books and now this beautiful TV series. Thank you Karen for all you do on this site. Hi Karen , Happy Anniversary to a wonderful writer , I hope you never stop writing , I first heard about Outlander from a friend and have been a fan for two years and am so grateful to her for recommending them to me , I have big Outlander collection in my library , plus the Book on Audio CD , I strongly recommend them to all fans , Divina Porter does a n amazing job, plus they are fun to listen to , I hope to be a fan forever, Happy Outlander Day, please post more soon. Happy Week, sincerely Mary Tormey. Wooooo, WHO, what WONDERFUL news that "Outlander" has been renew for Seasons 3 & 4!! Congratulations to all the Wonderful Cast; especially Caitriona Balf & Sam Heughan who excitingly bring Clair & Jamie Fraser to life!! Plus the hard working, very large Crew, who work in rain or shine to capture all of the magic that show up on our TV screens. But especially; Congratulations to Diana Gabaldon, for her wonderful stories starting 25 years ago to now have them broadcast onto the Worlds stage in such glorious, visual imagery!! To Ronald D. Moore, for having the foresight to listen to his writing partner, Maril Davis & his very talented costume designing wife, Terry Dresbach! OH, the Wedding Dress, Terry!! Then when Ron collaborated with Bear McCreary & Bear's lovely wife Raya Yarbrough, the "Outlander" music reached an all time high of hauntingly lovely, emotional music!! Thank you to Toni Graphia, Anne Kenney for writing from a woman's perspective & Ira Steven Behr, Matthew B. Roberts, plus many other writers for putting Diana's words into visual dialogue! Gary Steele's & Scotland for making the the visual of "Outlander" so outstandingly beautiful! Thank you all for a fantastic Season 1 & 2, I can't wait for 3 & 4!! Job so very, very well done to you all! !